The premise is simple. It is a digital space which allows you to share ten things, previously unknown, about yourself, to your friends or co-workers. Now, I may be living in ignorant bliss here, but I had to ask myself why one would need this? Surely our friends should already know these ten facts, otherwise should they really be considered friends? Are our egos really so large now, that we assume everyone is interested in our latest activities and proclivities? I do realise, that this piece is written with a certain irony. Who, after all, would care what i think about this particular website? Have we really created a world where there is too much information? Where we have too much to choose from? Or too much to say? I questioned a friend of mine recently, on his unwillingness to sign up to Facebook. He made perfect sense when he replied that he doubted, that by signing up to take part in Facebook, that it would actually make his life better. We now have tools that tell the world where we are at any one time. If we check in to a restaurant, or an airport, or even our place of work – 250 of our nearest and dearest know about it. Do we have too much choice in what to say, when to say it, and whom to say it to? In most areas of business, choice is seen as a significant benefit. The general perception is that the more you have to offer, the more your customer will want to buy and ergo, the more money the company will make. Hence the increasing amount of variants in all supermarket products. But, and according to the survey in Dave’s article, this is not the case. If we apply this thought to the UK TV market, we know that official figures record over 500 TV channels are now available in the UK (Source: BARB). Yet I wonder how many of those record significant viewing levels? How many, will be watched by less than 100,00 at any one time? In catering for everyone’s taste, and in the rush to monetise by brand expansion, have we forgotten what is really important? In my mind, quality should still be at the heart of any offering. Whether this is a can of fizzy drink, or a broadcast channel, or a website selling stuff, we still need to know that we can get what we want, at the price we want. What is the impact of all this brand choice on shopping behaviour? Shoppers now simply don’t have the time or mental bandwidth to compare and explore all of their options. Instead, the visual element of products becomes even more important which in turns put even more pressure on manufacturers and marketers. Eye tracking studies have shown that most shopping time is spent searching for known brands, and are most likely to buy the first brand they actively consider, rather than compare various brands. 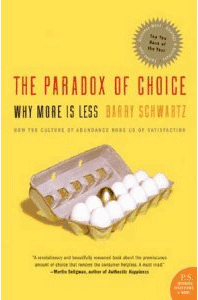 The 2004 book, ‘ The Paradox of Choice –Why More is Less’ by Barry Schwartz argues that eliminating consumer choices can greatly reduce anxiety for shoppers. He also discusses the significance of common research methods that utilize a Happiness Scale. In this area of debate, he sides with the opinion of renowned psychologists, who independently conclude that the plethora of choice we have now, can even lead to depression and feelings of loneliness. Within the book, there was one specific study cited that was particularly close to my heart. Together with Mark Lepper of Stanford University, Sheen Iyengar (the same lady that conducted the fizzy drink study), performed a similar exercise, but with chocolate. 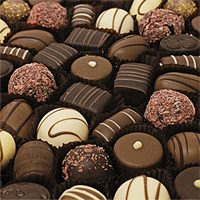 This found that when participants were faced with a smaller, rather than larger array of chocolates, they were actually more satisfied with their tasting. So brands must offer choice, whilst making choosing easier, through intelligent packaging, design, marketing and pricing. Brands need to help consumers regain their sense of control while supporting them in navigating these and really help to simplify the decision making process for the consumer.